Since last update, SPX has rallied up to blue "2?" which is actually the path I had sketched for it, oddly enough. 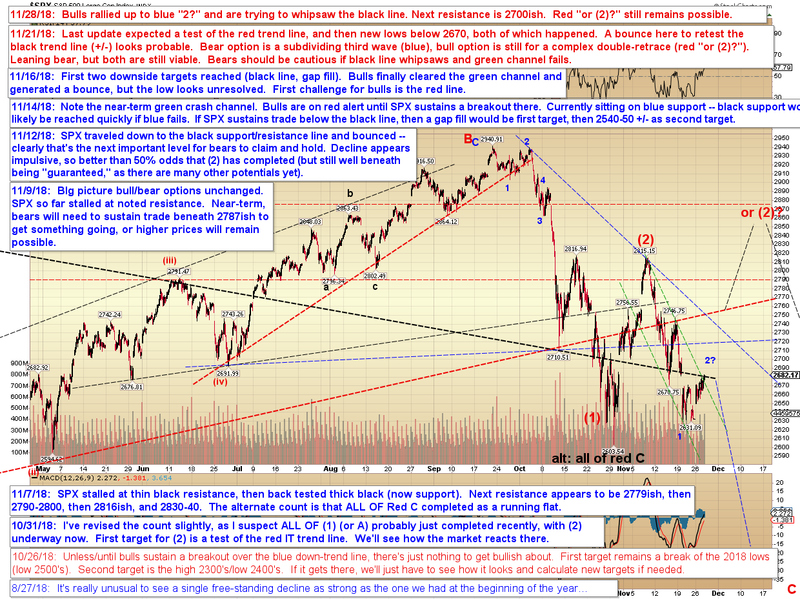 Despite following last update's projection, that was probably the "easy" part, because the charts are no longer making it an easy call at this inflection point. The pattern into and out of the low is sketchy and can be interpreted a few different ways. The market may be leaving its options open, and it will probably come down to what sorts of signals Powell gives today. Because, the fact is, the Fed is the one tanking this market right now. It is raising rates AND draining the $4.5 trillion in liquidity that was added through QE (2009-2014). Last I checked, they had drained about $350 billion over the past year, which is why the market hasn't really gone anywhere for 2018. As I've written about previously, the only thing that drives the market is liquidity. When there is excess liquidity, stocks go up; when liquidity is contracting, they go down. It really is that simple. The challenge for assets is that the Fed is still increasing their monthly drain. To date, the real economy has been so strong that it's been absorbing that drain without a crash -- but if the Fed keeps raising rates AND draining, it will likely overwhelm the liquidity that's being generated by the real economy and push us toward recession and a bear market. 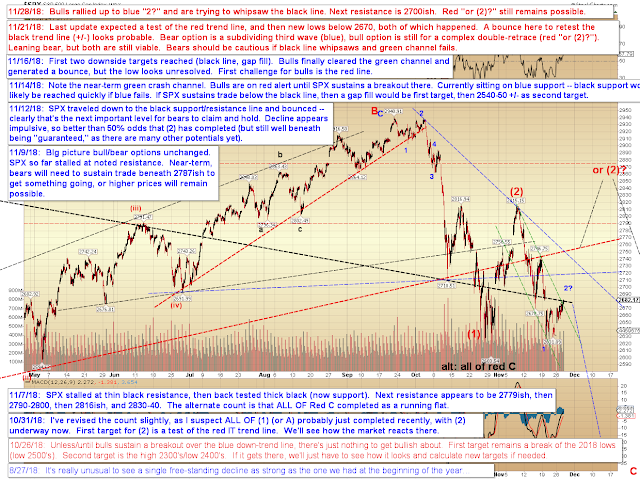 Accordingly, the market may be waiting on the Powell's speech to decide if it wants a complex red (2) (the one we've talked about, that's been on the chart for a while), or if it wants to tank directly in blue 3. The next few sessions will likely be pivotal. If SPX can sustain an upward move here, next resistance comes in near the blue lines, with the red line probably being bears' last line of defense against the more complex red (2). In conclusion, the tone Powell takes today will likely set the tone for the market itself for the upcoming weeks. Trade safe.